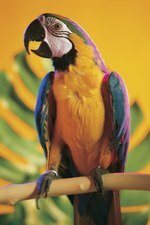 Lovebirds are small, colorful and playful birds with personalities similar to those of parrots. Contrary to popular opinion, lovebirds do not have to be raised or kept in pairs. These affectionate birds are happy to interact with their human owners for hours. However, if you don't plan to interact with your bird much due to work or other responsibilities, getting a mate for this highly social bird is advised. After choosing which one of the nine species of lovebirds you want to raise, you can be there from its very beginning by caring for your lovebird when it is still incubating in its egg. Purchase a fresh, clean and fertile lovebird egg from a reputable breeder. Make sure the breeding does not show evidence of inbreeding, old age or poor health, all of which commonly lead to unhatchable eggs. Purchase a high-quality, forced-draft, sterile incubator for your lovebird egg. Select an automatic turner that rotates eggs at least once every 2 hours and which has precise temperature control. Use either a wet bulb incubator or water reservoir surface system incubator, to maintain proper humidity and temperature. Make sure your incubator has a backup temperature controller you can set to less than 102 degrees Fahrenheit, in case the primary temperature controller malfunctions, so that you won't lose the lovebird. Set the incubator on a flat, stable surface -- away from direct sunlight and drafty areas. Hold your lovebird egg up to a bright light in a dark room six or seven days after it was hatched, to ensure there's an embryo inside. Look for a dark spot surrounded by veins to ensure fertility. Place the egg in the incubator. Wait 21 to 26 days for the egg to hatch. Be prepared to hand feed your lovebird a nutrient-rich mixture from a syringe, once it hatches. Talk to a veterinarian about hand-feeding your lovebird before it hatches, to ensure you'll know how to care for your lovebird until it is capable of feeding itself -- around 5 to 6 weeks of age. How Often Do Quail Lay Eggs? What Are the Signs When Parakeets Are Pregnant?